Video Conferencing Market size estimated at over USD 11 billion in 2017 and is anticipated to grow at a CAGR of more than 10% from 2018 to 2024. The video conferencing market is driven by the growing demand for unified communication solutions among the industry verticals. As organizations are expanding their horizons to different geographical markets, establishing and managing business communication processes can become a complex affair requiring huge expenditure on infrastructure procurement and network management. For maintaining the effectiveness of distinct synchronous and asynchronous communication functions at different locations, companies have to assign dedicated human resources for managing separate communication modalities. UCC systems enable consolidation of all these modalities into one unified framework, which can be configured and controlled centrally from a single hub. This results in huge cost savings for companies, who operate and plan to expand their presence to diverse geographic locations. The increasing emphasis of the enterprises to reduce the cost of communication is also a major force promoting the adoption of the video conferencing solutions. As business dynamics are changing rapidly, maintaining the traditional communications solutions and infrastructure are also becoming very complex and costly. This is encouraging companies to move toward cloud solutions to extend and manage communication resources in a cost-effective manner. The cloud solutions significantly reduce the upfront expenses as they shift enterprises’ cost of designing communication solutions to expert service providers. 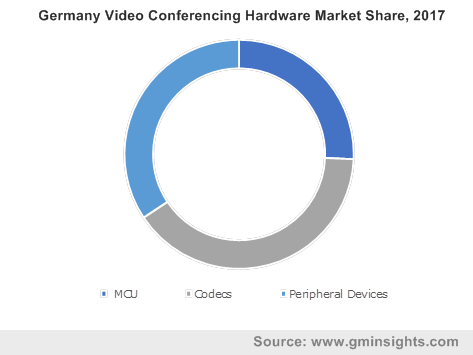 Hardware accounts for over 50% stake in the video conferencing market. The hardware segment includes codecs, multipoint control units, and peripheral devices. The high adoption of the codecs among the enterprises to facilitate video conferencing among the employees is the primary factor supporting the market. The growing demand for peripheral devices also drives the market growth. The peripheral devices are anticipated to grow at the CAGR of over 10% during the forecast timeline. The widespread adoption of the webcams, microphones and other dedicated video conferencing solutions is augmenting the market growth. Software is projected to grow at a CAGR of more than 14% over the forecast timespan. The growing adoption of cloud-based video conferencing solutions is the primary factor driving the market growth. The benefits offered by the cloud video conferencing solutions over traditional solutions such as scalability, flexibility, and cost-effectiveness are the major factors driving the software market. Moreover, the increasing trend of the BYOD and enterprise mobility solutions among the organizations is also promoting the demand for the video conferencing software. Service market is also anticipated to exhibit a CAGR of over 10% during the projected timeline. The growing demand among the enterprises to outsource the video conferencing services and concentrate on their core business operations is propelling the demand for third-party service providers. Moreover, the high intensity of competition among the market players and the growing need to provide enhanced customer experience is also encouraging vendors to offer a wide range of professional services to gain customer loyalty. 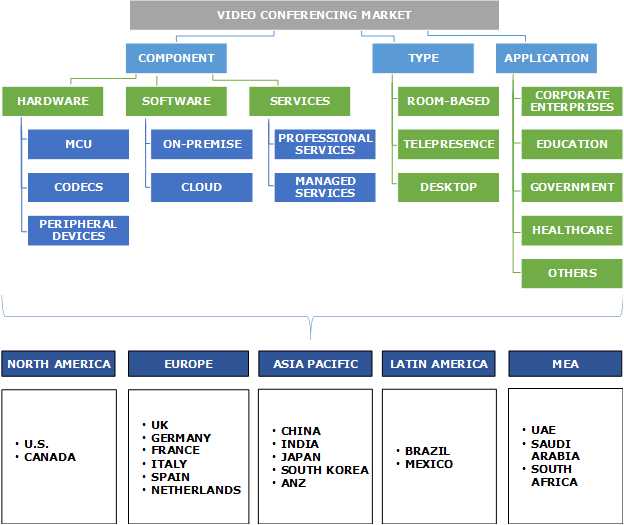 Telepresence holds more than 40% share in the video conferencing market. The ability to support the business enablement is the primary factor, augmenting the demand for the telepresence among the organization. It enables enterprises to collaborate and communicate without inconvenience and provides a two-way real-time communication. Moreover, its ability to offer better collaboration among the organizations to enhance the overall productivity of the enterprises encourages its adoption among the enterprises. Desktop segment is anticipated to attain a growth rate of approximately 15% during the projected timeline. The desktop video conferencing is gaining a lot of traction due to its ease-of-use and cost-effectiveness. It allows users to directly host an online conference from their desktops, laptops, and smartphones without the requirement of any other peripheral device. The widespread adoption of the browser-based and mobile video conferencing applications will augment the demand for the market. Corporate enterprises are leading the video conferencing market with over 65% share in 2017. As more and more organizations are adding collaboration tools such as smart interactive whiteboards and interactive displays, the need for easy and cost-effective video conferencing tools is also increasing. Collaborating with local teams and remote participants in real time requires fully-integrated software conferencing applications. This is also driving the growth of the market. The BYOD trend has emerged as a great way to enhance convenience and work satisfaction for employees; hence, a major section of the industry is either already using it or are in the process of adopting it. Allowing employees to bring their own devices to the office has helped companies cut hardware and service costs considerably. Furthermore, employees are likely to exhibit enhanced productivity while using a familiar device for work. SMEs are rapidly adopting the trend of allowing employees to use their personal mobile devices and benefit immensely by saving hardware costs. A properly configured device with adequate security measures can preserve and enhance an employee’s productivity, working from almost anywhere. North America is dominating the video conferencing market with over 35% share in 2017. 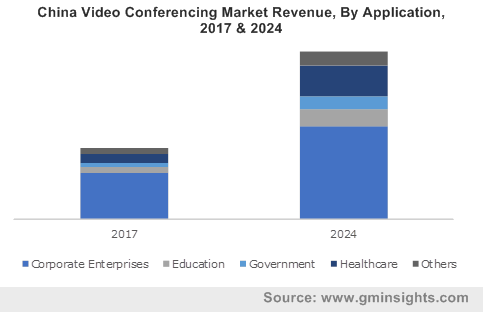 The market growth is attributed to the high adoption of video conferencing solutions over the last decade due to the availability of highly sophisticated network infrastructure in the region along with the local presence of global players such as Cisco and Polycom. These players offer the most advanced enterprise communication capabilities to the businesses operating in the region in response to the consistent demand for such solutions from both midmarket as well as large enterprise customers. Moreover, a high degree of consistency in terms of the acceptance toward BYOD policies and enterprise mobility among the large as well as mid-sized enterprises also foster the market growth. 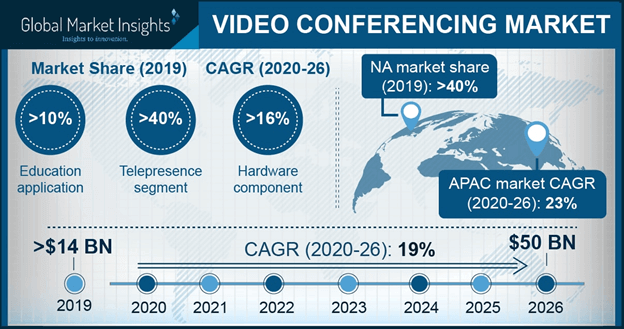 The Asia Pacific video conferencing industry is anticipated to grow at a CAGR of over 14% during the forecast period. The growing demand for streamlining enterprise communication infrastructure, increasing adoption of cloud-based video conferencing solutions, and favorable government initiatives for modernizing ICT infrastructure are the major factors driving the market. Telco is in a region leveraging its existing infrastructure and technological expertise to move beyond legacy voice and data services to IT services. Developed ICT markets such as Japan, Australia, and South Korea are witnessing increasing rollouts of different delivery models for UC services. The video conferencing market is highly fragmented and volatile due to the presence of a large number of market players in the space. These players are competing on the various video conferencing products and services and targeting distinct level of enterprises models. The major market players are leveraging on merger and acquisition activities to strengthen their position in the market and increasing market share. Moreover, end-user consolidation is also playing an important role in determining how the market will evolve over the timeline. Several large enterprises are taking steps to streamline their different business communication functions by consolidating video conferencing solutions under one vendor. This will surely encourage the market players to incorporate distinct video conferencing capabilities into their frameworks to deliver a truly unified communication experience to their customers. Over the last decade, an explosive growth in the use of video conferencing technology has been witnessed. It is becoming a fundamental tool for businesses and to enhance collaboration and communication between partners, employees, and customers. The technology has developed significantly from its early adopters to its current form of mass adoption. The video conferencing is becoming a component of the IT infrastructure that enables interaction between businesses. The organizations are looking for providers of telephony, network infrastructure, and business applications to include this ability as a part of their offering.